Weihua Crane Machinery Co., Ltd.
Carrier-beam crane take carrier-beam as spreader, carrier-beam together with hook and removable electromagnetic chuck to adsorb and carry loads. Widely used in steel mills, steel mills finished products storage, shipyard, storage yard, cutting workshop and other indoor or outdoor fixed cross, handling and transporting steel tube, steel billets, steel coils, long container and other materials, especially for lifting long objects. Carrier-beam spreader included rotating, flexible and fixed carrier-beam. Carrier-beam crane including three kinds: general carrier-beam crane, upper rotating carrier-beam crane, lower rotating carrier-beam crane. Lower rotating carrier-beam crane included lower rotating telescopic carrier-beam crane. Our company has nearly thirty years of carrier-beam cranes production experience, can also produce special carrier-beam crane, such as overlength carrier-beam crane. Weihua Crane is professional material handling equipment manufacturer and servicer with largest production in global. 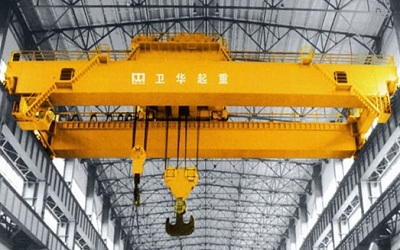 Provide you with overhead crane, gantry crane, electric hoist, etc. of safe, reliable and efficient crane solutions and services. General use carrier-beam crane mainly consists of trolley, carrier-beam spreader, bridge, cabin and crane traveling mechanism, etc., there are two types of carrier-beam spreader arrangement: vertical main girder type, parallel to the main beam type. The picture shows the vertical main girder type, parallel to the main beam type design rotated 90 degrees. Trolley lifting mechanism operating principle: take the variable frequency motor as power source, shifting through the gear and then drive the two reels by reel coupling system, through wire rope reeving system to complete the rise and fall of the carrier-beam. One reducer drive two rolls or two rolls of rigidity connection, to ensure the two hooks synchronicity. Trolley traveling mechanism takes the four wheels as support for the trolley, using a separate set of driving system for centralized driving of the trolley. Carrier-beam spreader consists of carrier-beam, removable magnet and hook, etc., electromagnet spacing can be adjusted according to requirements. Trolley traveling mechanism driving wheels drive. Bridge composed of main beam, end beams, walkway, cabin, ladders, railings and other components, structure and properties is the same with double-girder overhead crane. Driver’s cabin is enclosed full-field view structure, the bottom set with see-through window panel, door and window using toughened safety glass, which with good appearance, sight, and no operating eye corner; cabin door and window has sealing strip, with good sealing. Cabin operation board adopts linkage unit, equipped with the operating handle, as well as start, stop, emergency stop, fault reset, lighting and other push button switch of each mechanism. Crane traveling mechanism drive solutions: driven by motor, through coupling and drive shaft transmit power to the reducer, after the gear reducer, and then through the driving shaft and couplings to drive the active wheel, drag the whole crane, complete crane longitudinal movement. Wheel ends all set with rail clearer, so as to automatically clear the track surface obstructions when crane walking, to ensure the safety of the crane walking. 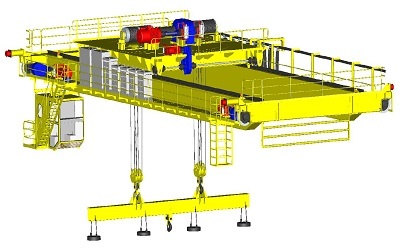 Upper rotating carrier-beam crane is lifting machinery, through upper trolley rotating, drive the carrier-beam rotation, through carrier-beam spreader, handling and lifting objects. Upper rotating trolley can drive carrier-beam spreader rotate: 0 ~ 270 °, can meet materials steering, cross-stacking and other requirements of users. Upper rotating carrier-beam crane mainly consists of trolley, carrier-beam, bridge, cabin, crane traveling mechanism and other components. Trolley is composed of upper trolley, lower trolley and trolley auxiliaries. Upper trolley fitted with lifting mechanism and ring traveling mechanism, lifting mechanism for lifting container spreader, ring traveling mechanism for driving the upper trolley rotate. The lower trolley fitted with circular track for the upper trolley traveling and trolley mechanism, which can drive the upper trolley to do traversing movement. Upper trolley hoisting mechanism operating principle: take the variable frequency motor as power source, shifting through the gear and then drive the two reels by reel coupling system, through wire rope reeving system to complete the rise and fall of the carrier-beam. The upper trolley circular traveling mechanism composed of inverter motor, reducer, brakes, three wheel sets, three horizontal wheels and others, which can drive the upper trolley rotate 270 °. Lower trolley traveling mechanism takes the four wheels as support for the trolley, using a separate set of driving system for centralized driving of the trolley, driving the trolley part do traversing movement. Carrier-beam spreader, bridge, cabin and crane traveling mechanism are the same with general use carrier-beam cranes. Lower rotation carrier-beam crane is lifting machinery use its lower rotary hanging spreader, handling and lifting loads. Carrier-beam spreader rotation angle: 0 ~ 270 °, can meet materials steering, cross-stacking and other requirements. 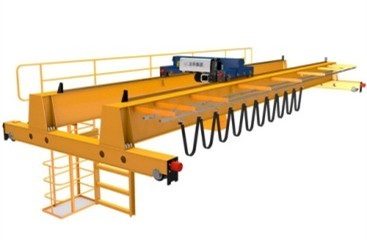 Lower rotation carrier-beam crane mainly consists of trolley, rotating carrier-beam, bridge, cabin, crane traveling mechanism and other components. Trolley lifting mechanism roll group and four fixed pulley composed of special rope winding, not only can resist torque when carrier-beam rotation, but also reduce the swing amplitude of the carrier-beam. Lower rotating telescopic carrier-beam upper part is slewing mechanism, the lower part is carrier-beams, between the hook and magnet, slewing mechanism and carrier-beam adopt slewing bearing connection, driven slewing bearing by three-in-one gear motor, so as to rotate the hang beam. It mainly consists of lifting pulley block, slewing mechanism, rotating beam, telescopic beam, telescopic drive mechanism and solenoid. Telescopic beam at both ends of the rotation beam, its main body welded by steel plate and shaped steel, using cross-sectional structure, etc. ; equipped with traveling wheel at its front, driven by chain drive system that can make the carrier-beam telescope freely. Retractable carrier-beam adopt welded steel box, with high strength and rigidity; driven by rotation mechanism can rotate the angle range from 0 to 270, and depending on the different hanging objects, set different lifting point distance. Lower rotating carrier-beam only rotating 270 °in the working plane, and according to the specifications of the lifting material (different thickness, length, number of sheets) and lifting weight, adjust the lower part of retractable carrier-beam’s length and electromagnet spacing electrically within a certain range, while adjusting the magnetic of electromagnet, which increasing the types of lifting materials under the premise of safety, stability and reliable, is a kind of multi-functional new type spreader. 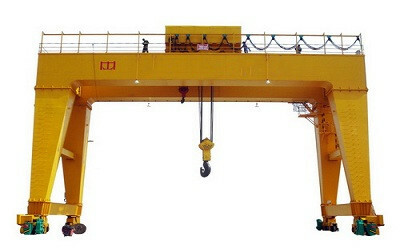 Bridge, Driver’s cabin and crane traveling mechanism are the same with general use carrier-beam crane. Simply complete the form below, click submit, you will get the price list and wo will contact you within one business day. Please also feel free to contact us by email or phone. Weihua Cranes started since the year 1988; it is professional material handling equipment manufacturer and servicer with largest production all over the world. With Weihua Cranes historical influence, “China Crane Town” (which covers more than 2/3 crane market in China) developed in the area around Weihua Cranes headquarter. 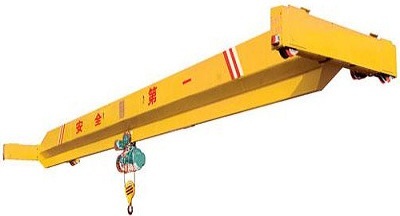 Weihua Cranes main businesses are researching, developing, manufacturing and sales of all kinds of lifting equipment. We have passed the ISO9001 quality system certification, ISO14001 environmental management system certification, OHSAS18001 occupational health and safety management system certification, CE certification, etc. Weihua Cranes advantages and differences with other crane manufacturers are that we have professional crane team to provide you with safe, reliable, efficient crane solutions and services, and as far as possible to reduce your cost. Crane your business, let’s develop together! Weihua Cranes become one of general hoisting machinery manufacturing industry leader with the largest production and sales volume. We can provide electric hoists, single/double beam overhead cranes, gantry cranes, and such varieties of lifting equipment 10 serious more than 200 types. The lifting capacity of the overhead crane can achieve 1000t, and the gantry crane 900t, to meet all kinds of project need. Weihua Cranes is committed to provide total optimized crane program solution and perfect service to help customer to save cost and improve efficiency. Weihua Cranes has Technology Testing and Inspection Center authorized by the state, post-doctoral research station, obtains 283 technology patent certificates and inventions, R & D team of Weihua with 600 people and with Shu-zi Yang (academician from the Chinese Academy of Engineering) as the foregoer, is the biggest one in general purpose crane industry in China. Weihua Cranes now adopted the “lean production management”, the undaunted testing and outstanding market performance, ensuring Weihua Cranes stand out as the leading brand within crane industry. Weihua Cranes continuously make the innovation on technical and strict on QC management to keep the products quality steady improving. Weihua Cranes total asset is of 0.78 billion US Dollar, over 6000 employees, covers an area of 3.42 million square meters, one of Weihua Cranes workshop is the largest within the whole world crane industry. A varieties of 1700 sets manufacturing and testing equipment, including machining, heat treatment, welding, assembly, testing and packaging shipped metering and other ancillary equipment with a full range of advanced production scale and production capacity. Production and sales of overhead and gantry cranes won the first in China for continuous 8 years. And now, total production amount of Weihua Cranes products achieve world first. Weihua Cranes has developed strategic partnership with Siemens, GH Spain, Demag, SEW, Schneider, etc. Weihua Cranes are widely used in machinery manufacturing, iron and steel metallurgy, nuclear industry of mining, water conservancy and hydropower, roads and railways, electric power, automobile manufacturing, petrochemical, port logistics, shipbuilding and other material handling, etc. We have successfully exported to more than 90 countries and regions such as the United States, Great Britain, Russia, India, Brazil, Peru, South Africa, Mongolia, South Korea, Australia, Southeast Asia, the Mid-East, etc. And get well reputation. Weihua Cranes with strong capacity, focus on customer service, provide with first-class quality, safety and reliable products, create more and more value for customers, these are the reasons we set-up stable and long-term relationship with our customers.